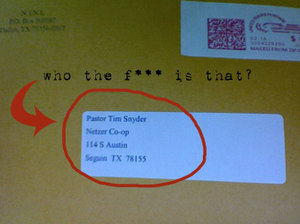 Photo: A package sent to me by my denomination - the ELCA. PS: I didn't used to bleep my profanity. But now that I'm a pastor, I have to start watching my f***ing language. Today is Ash Wednesday and the beginning of our Lenten Journey. This is a mournful-hopeful journey. Its a humbling experience for me both Lent / Easter has, for the last few years, marked significant transitions and times of growth. So today I am marked with ashed on my forehead anticipating with much wonderment. Over the next 40 days, I'll be posting some special podcasts on the lenten season: poetry, words from our elders, and thoughts from our monastics as we explore the season together. Also, The Netzer Co-Op will be hosting some special events - this front image might help you keep track...so save the dates. 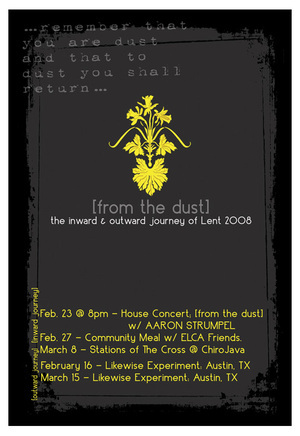 "From the dust I have come, to the same I'll return..." [aaron strumpel] (dot) com. I walked in to the Chapel of the Abiding Presence a little earlier than I normally do. Three times a week I enter this gothic chapel on the campus of Texas Lutheran University to share in what we consider to be a "community of faith & learning". To be honest, I didn't want to go. But that morning I had stumbled through a hurtful experience with friends who I've worked with since high school. I needed to be in that place to refocus. To my dismay our Praise & Worship Music team was leading music. I was to hurt to praise Jesus with such peppy, simplistic prose. And I've had this problem for years - the over exuberant music & worship isn't authentic to me because its overbearing. I've had dozens of conversations with people who too will never engage that community of faith in the Chapel because of this attitude. 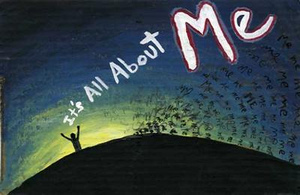 It reflects what Walter Bruggemann calls our "therapeutic culture": its all about me and Jesus...but its not honest and its not ok to use music and attitudes in worship to therapeutically ignore the hurt, to cover up our broken and paint pictures of our communities that assert how well put together we are. Our whole culture preaches this cover up! No, we must embrace a Psalmic posture - we must be willing to dwell in the messiness long enough for us to see that indeed God is in the brokeness too. We must do this because we must have experience to reflect the character of God which says "there is no where you can go to escape My Love.". Friends at Enter the Worship Circle and most articulately with Chair & Mic, Vol. 2: Aaron Strumpel, use four words to describe their experience of God. PROTEST, ADORE, DISCOVER, RELOCATE. Notice "protest" first - let us not cheapen God's gracious love with therapeutic cover up. I spent the other week in Mandeville and I was able to RE: connect with several old friends, mentors and loved ones. It was a really important time for me to RE: connect with my "old roots". Its easy to forget that part of who you are that is told by the story of where you are from. I was really impacted by a long car ride into New Orleans with Sean, a long breakfast with Dana and a long & late conversation with my friend Paul from high school. Conversations like those don't happen just happen...they were conversations of growth. This past Monday, Bri Morris, Paul Soupiset, Michael Gomez, and I got together for a meeting with Synod (why does the ELCA use funnny language to mean a "geographic area") Staff - the Bishop and his assistants - and then my friend Ruben Duran (who works in the national offices) to initiate some good conversation about the future of The Netzer Co-Op and my potential candidacy for ordained ministry - more funny language that means "pastor". It was an exciting conversation from the moment Bri meet us at two saying her car wouldn't start all the way to the end (yes Bri's car magically started up again). We talked about options for me a lot and how that conversation fit in to the wider support of The Co-Op. As of today, I'm entering candidacy through a process called "Theological Education for Emerging Ministries". This is an alternative route towards ordination in the ELCA. I'll remain in Texas (with The Co-Op) after graduation but will do short term courses and online distributive learning through Wartburg Theological Seminary. Some of you have been asking me to publish the Sermon I gave up in Fairfax, Virginia at the beginning of this month - and so here you go: Download penink_message.pdf. COMING SOON: A Series of Posts under the category of "deep ecclesiology" - you'll get a sneak peak at the researching & writing I'm doing as part of my Senior Seminar.